kind of sweet or like candy, although not an identifiable scent. It was not too strong, and not unpleasant. Aha! I am so frustrated with this stinky cloth thing I googled it just to see if anyone else has this, and was actually a bit relieved to see that Dawn, which I have used for a few years...with this problem...might be causing it. I shall be replacing it with the Palmolive to see if that takes care of it. My dish cloth has the smell immediately, regardless of whether or not I wring it out, air dry it, whatever. I have just gotten used to throwing each one in the wash after one use. Thanks, I hope I can say my smelly problem is solved after I get a new detergent. It works GREAT. I love the soap and it doesn't make my sponge smell. The only problem is I can't find it in the stores. Where can I buy it now???? Thanks. 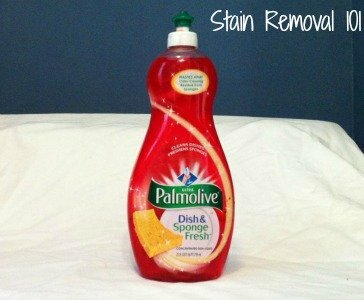 This is a great dish liquid! It always keeps my sponges fresh. I would recommend this product to anyone. 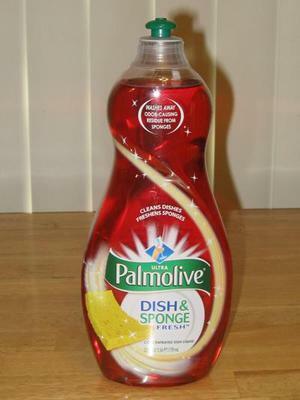 I am pretty unhappy that Palmolive has discontinued this product. I thought it worked very well. I actually have about two teaspoons left. I began checking for another bottle every time I went to the grocery store when my current bottle had a little over a quarter left. I think I will contact the company and ask them why. I realize I may get the same old pre-written response most companies use. They always begin with either an apology or a thank you for contacting them. I was so disappointed when the dish and sponge fresh got discontinued. Its the only thing that kept my dish sponge from getting that horrible musty smell when it dried. I think I read elsewhere just recently that this product has been discontinued. Which is fine with me. I used it to wash my dishes, and anything I washed with it developed a strange, chemical type smell to it. Not only that, but I noticed that my silicone scrapers and spatulas had a very strange, nasty chemical type taste to them. They still have it after a couple years of not using this product anymore. I don't think the taste will ever come out of them.